If you are joining us in the middle, go to www.fiskateers.com to start from the beginning. Today, we are celebrating Fiskars' signature color, ORANGE. Almost everyone is familiar with Fiskars' famous orange-handled scissors, but Fiskars makes so many other wonderful products for crafting, sewing, gardening, and more. 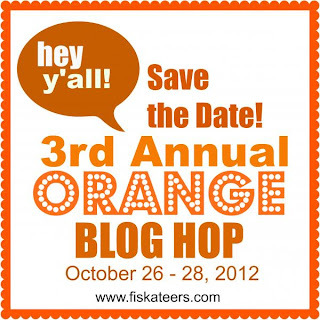 Each stop along our Blog Hop will feature different Fiskars' products with a big helping of ORANGE! For my ORANGE project, I decided to make something a little scary! Just a little scary for me too...I had never made a home decor collage project. Although, all scrapbook pages are sort of a collage, and I'd created banners, this was different for me. Lots of steps and layers were a bit intimidating, and I placed and re-placed and positioned and re-positioned all of the elements a zillion times before I started gluing. I started by arranging (and re-arranging) an assortment of Halloween stamps onto my Fiskars stamp press as seen below. Then, I stamped randomly on some white tissue paper using black Stazon ink. I glued the tissue onto a thick sheet of cardstock. I started punching and cutting...I spy with my little eye Fiskars Grandma's Doily, a small cloud (as clouds and ghosts), a small bare tree, and I used my Fiskars Ultra Shape Xpress to cut this tree from the Woodland Tree Template (the checkerboard-like, flocked paper is from My Mind's Eye). Then the arranging and layer began (that part lasted a long time). Finally gluing. Now, all fun blog hops have a few sur-prizes thrown in! Leave a comment below, telling me one thing you want to create but never have yet. I'll choose a winner on Monday who will receive some "happy mail". For more information about Fiskars and the Fiskateer program, you can go to http://www.fiskateers.com/join/. she's the next blog on the hop. Something I want to create but never have? Fortune cookies come to mind, but I'm guessing you mean crafty instead of edible. I'm not sure. I usually make whatever crafty thing pops into my head! Wow....this is super super neat. You have my attention now. This is great. You did an awesome job on this Kelly. I have wanted to create an shadow box. I love them so much but just havent yet been able to make one of my own. I will some day I know because I always have had this thing for them. You are a natural Kelly! I love this collage and the stamp and patterned paper choices are perfect! The little ghost peeking out is adorable along with all the other little touches. Keep playing until you no long have to place everything before gluing. I'm quite sure everything you make would be magic! I completely forgot to mention something I've always wanted to do, but haven't. I would love to learn how to use an arc welder. I'm fascinated by metals, old and new, rusty and shiny, and would love to play at a very large scale requiring an arc welder. I love what you did. I've never work with the tissue paper like you did and I love how the background turned out. I hope to give that a shot maybe at christmas. Cute project Kellystar. Lots of beautiful inking. WOW!!! All your positioning and repositioning paid off, your project turned out awesome! As for something I've been wanting to do for awhile and I haven't is to use my cloud punch in a non-traditional way. Thank you for the wonderful inspiration! It worked out because that is amazing! I really love it....all the different embellishments and all the stamps...it is fantastic. One thing I wanted to create and never have yet is a quilt for my bed. I know, it isn't a paper project but in a way it is the same thing. You have to match colors, designs, and do the shapes, then put it all together. Kelly, I sure hope you are proud of this! I can't believe this is your first home decor collage project ever!?! I think it is perfect - not too over done, perfect blend of coloring too. Believe it or not I have always wanted to try a collage project so I really appreciated your going through each of your steps. I also appreciate that you were honest and told how you went over and over again with the laying out process before you finally glued them into position. I know I would do the same thing! How do you fit all this in your busy life? I have seen the stamp press at the store but didn't quite get how it works. It was good to see your example. LOVE how you used the cloud punch!! That is so creative! I have the woodland tree template and have often thought it would make a nice tree to hang family pictures on if I used a projector to enlarge it onto my living room wall and paint the shadow. Too daunting for me but my mind does dream of the idea! Wow, this looks great. I love how you stamped the background. TFS. Your project turned out great!! Love all of the stamping and colors. Something daring I would like to try is glass blowing... wouldn't that be cool. Thanks for sharing. Wow I love this thanks for sharing the project with us! I love how the background page turned out with with your stamping and inking. Great to see how it works on tissue paper. Turning your cloud punch into ghosts...brilliant. I would like to create something using alcohol inks. I totally love your project! The background is amazing! I will have to give this technique a try. I think I would like to try using Copic makers. I'm not that great at coloring in, but I want to learn. WOW!! Great mixed media project!! Thank you so much for sharing. Love the mixed media project! It is fabulous! I would love to finish the farm sign that is in the planning stages. It will be a mixed media project, too but I will also be including real felted wool from our sheep. What a fab project Kelly - you have done an awesome job!!! I have some canvases gathering dust, waiting for me to get brave enough to leap from cards & layouts, off-the-page to make a decorative "family" collage to hang on the wall. I know it's really not such a leap from scrapping to mixed media, but I somehow felt a bit intimidated at first... I got over it quickly and maybe I can do one for each holiday/season and switch them out in a frame! Show me yours when you are done! Oh my, I love your collage! This really inspires me to do a 3D display tray with different chipboard and techniques. What a great collage. I have never made a chipboard mini album but would like to!! Thanks for a chance to win some goodies!!! Believe or not, the one thing that I have never created is a Holloween card. I want to try and I think your collage idea using the Fiskars stamp press is my inspiration. After seeing this, I want to make a collage background. I've made a stamped backgroud, but never something as involved as this! What fun! I'll have to make note of all the steps! Wow, you did such a great job on this! WTG!!! I have never made a pop up card before. One of these days I plan on giving that a try. Brilliant.I've been decoupaging some pumpkins and your tissue paper technique will make fantastic ones.Thank you so much for such wonderful inspiration. Awesome Halloween decor. I like how you created the background and the checkered tree. I have never altered a canvas before but would like to try. Cute idea. Love the cloud ghosts. (I have that punch). I have not made any type of banner, and your techniques could look great on one. Hi Kelly! What a SUPER amazing and creative project!! Wow!!! Thanks for sharing this project. I really enjoyed your process. :) I would love to try creating on canvas. I own some mini-canvas squares, but have been too chicken to try yet. What a great project, Kelly! I love how you stamped on the tissue and then used it as the background. Until I read your post, I thought it was just really cool patterned paper! I would like to play with Distress Stain. I have one bottle and never seem to think of anything to use it with. Oh, and every time I come to your blog I smile because I just love the name of it! I've been wanting to make stuffed animals out of gloves, and I want to make some dog and cat blankets for my couch, both using my Fiskars sewing goodies. Somehow, I just haven't had the chance to do those yet. Forgot to include my Fiskateer #! It's 1135, and my user name is RatGirl, and my name is Veronica.